It’s part of a celebration called Twitch Day. 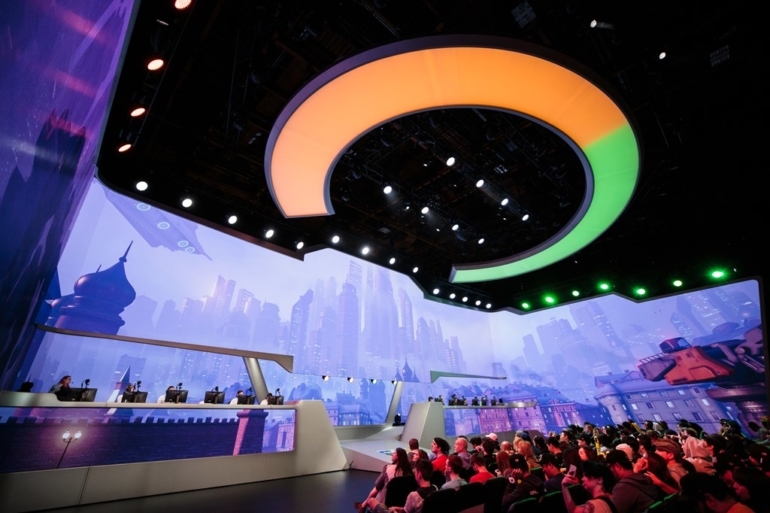 The Overwatch League has been a big hit on Twitch since its debut in January, and tomorrow Blizzard will be celebrating their streaming partner with an event called Twitch Day. As part of Twitch Day at Overwatch League, fans entering the Blizzard Arena in Los Angeles will receive Twitch swag, including t-shirts. Twitch streamers such as Stefan “Datto” Jonke and Anthony “Harbleu” Ballo will be on hand for meet-and-greets, autograph signings, and more. For the fans at home, though, there are perks as well. Watching Overwatch League matches on Twitch earns you League Tokens in-game to be able to buy Overwatch League team skins, but as part of Twitch Day, fans can earn even more Tokens than usual. In fact, Token rewards will be doubled. Viewers will receive two tokens per live map finish instead of the usual one token, and a percentage of viewers who “view the conclusion of a final map during the live broadcast will randomly be awarded 100 League Tokens.” That’s enough for one skin in-game. Twitch and Blizzard are also set to reveal additional in-game content that will be included in the new All-Access Pass. The All-Access Pass is available for $29.99 (or $19.99 for Twitch Prime members) and it includes unique in-game items, passholder-only chat rooms, exclusive video content and behind the scenes cameras, and special emotes and badges in Twitch chat. Back in January, it was reported that Twitch paid $90 million for the broadcasting rights to the first two seasons of the league. Between the viewership of over 100,000 on most days, the All-Access Pass, and cheering for teams using Bits, it’s definitely been a lucrative partnership between Blizzard and Twitch so far.